This was my first foray into the world of Sherlock Holmes and I absolutely loved it! Though it was written in the 19th century, a time noted for its long novels, The Sign of Four is fast-paced and very easy to read. There’s no superfluous information – the reader is given the necessary facts and developments in an orderly and effective fashion, with remarkable descriptions and delightful humour thrown in along the way. But it’s far from a mindless read. Through prompts and questions from Sherlock Holmes, a teacher among other talents, Watson, the narrator, must fill in the blanks even when the former already knows the answer. He wants Watson to use his brain too and this, in turn, encourages the person reading. The mystery itself is a very exotic one involving a disappearance, a few Indians, some Asian islanders, and valuable treasure. But if that’s not enough to keep you entertained, just leave it to the wonderfully quirky characters. Watson is lovable and inquisitive, and he always manages to ask the right questions. Holmes is a remarkable master of all trades, and his innovative thinking never fails to induce a sense of wonder. Altogether, The Sign of Four is an impeccably written mystery filled with never-ending wit, excitement, beautifully described locations, fantastic characters, and plenty of puzzles. 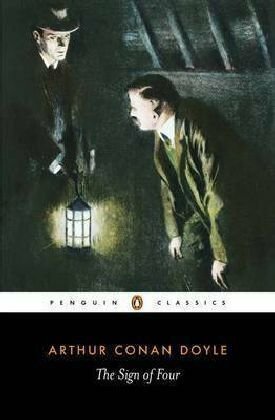 I can’t wait to read more of Sir Arthur Conan Doyle's masterpieces! © 2011-2014 Life Between Pages. Powered by Blogger.